Cornwall High School is a new facility designed for 1600 students. The site is located on top of a mountain overlooking the Hudson River Valley. The unique site location leads directly to the organizational concept of entering the facility at its top most level which is grade at the top of the mountain then stepping down the mountainside as a series of parallel bars connected by a central glass spine. The spine projects trough the final bar out over the wooded landscape, overlooking the Hudson River and is the reading room of the library. The high school includes gymnasium, natatorium, 600 seat auditorium, art rooms, cafeteria, classrooms and computer labs. Outdoor facilities are included for baseball, soccer, tennis and track sports. 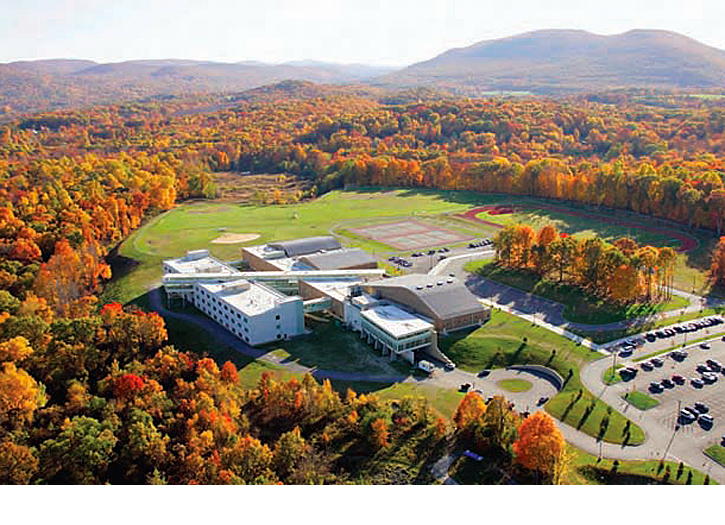 This school is the inner of state and local AIA Design Awards.